O'Reilly Media, former.ly known as O'Reilly & Associates, an American media company specialising in technology books, conferences, courses, news, etcetera, head-quartered in Sebastopol, California, with numerous international offices in China, Germany, Japan, Taiwan, and United Kingdom, has acquired oreil.ly domain name from Libyan Spider, apparent.ly for internal URL shortening services based on bit.ly pro platform. 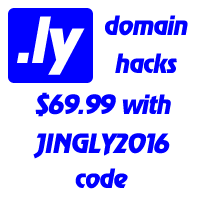 This is already a third big .ly sale within a month, following dai.ly, which was acquired by French Dailymotion and quick.ly, which went to a Canadian start-up. If the sales keep coming like this, we will be seen big names serious.ly changing hands week.ly or even dai.ly indeed. Big Hawaii International has something cooking with on.ly. Their trademarked jingle goes as: “Socialize your links”. playfi.sh is another one, following the suit. An Irish guy went for http://connol.ly/ – his surname of course. Nowadays every big firm has its own shortener: am.az, dai.ly, fb.me, flic.kr, goo.gl, lnkd.in, shar.es, post.ly, wp.me, youtu.be … just to mention a few.